Thank you all for letting us into your homes! That's why our customers are more than customers, they are family. Our customer Jeff purchased this stained glass window (see below). Its original home was a farmhouse in a small village in Northern Holland. Jeff had the glass refinished and framed and it is now a showpiece in his home in Indianapolis. Thanks for sharing these photos with us Jeff! A tale of two purchases...How lucky were we to meet Evelyn! 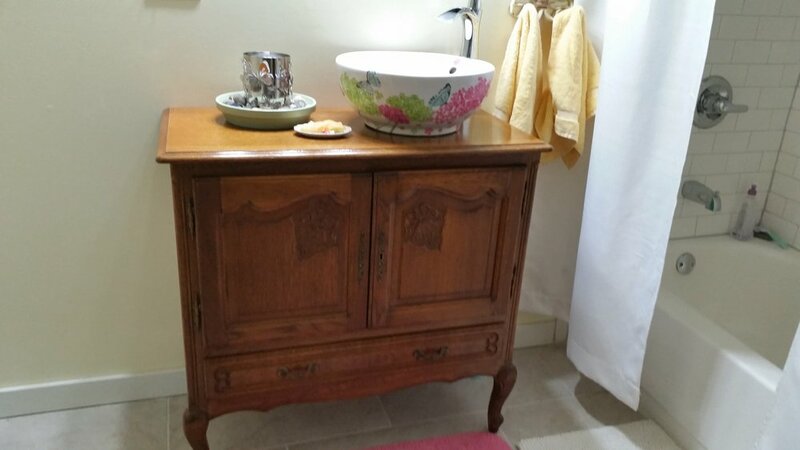 She turned two French Country pieces into functional and unique pieces for her home. 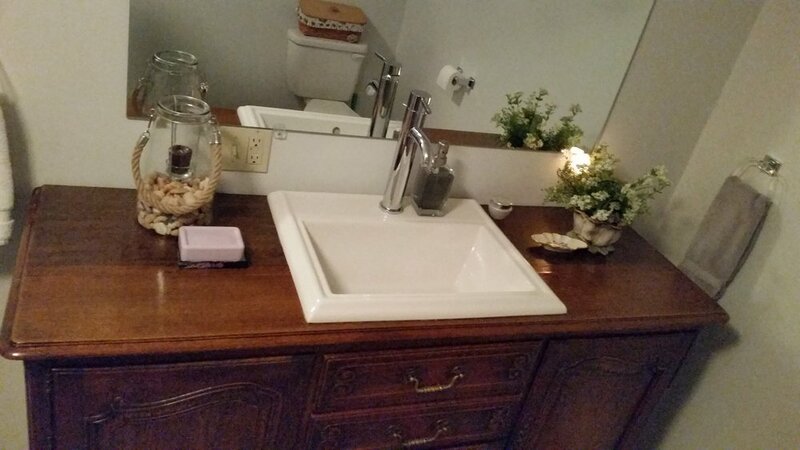 Just take a look at that beautiful bathroom vanity! 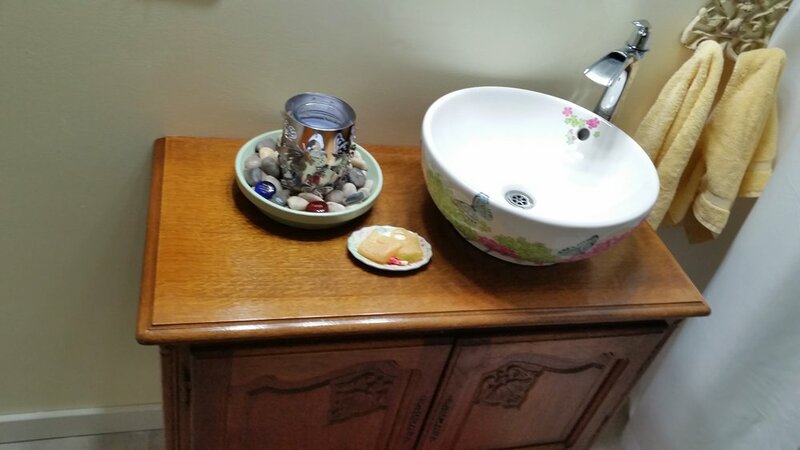 Thank you for letting Europa Antiques be a part of your home decor, Evelyn! This gorgeous Dutch Biedermeier server made a perfect Christmas present for one of our best customers in Cambridge City Indiana. A perfect fit in a beautiful American home. 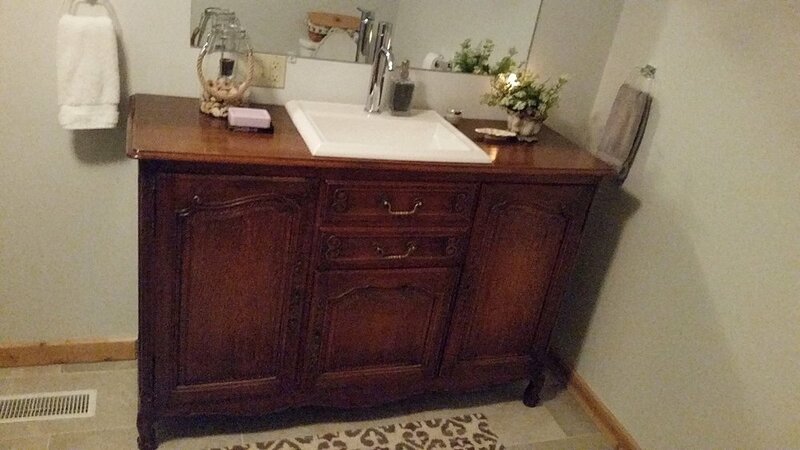 This beautiful antique Brittany-style bedroom suite fits perfectly in its new home in Tennessee. Original French Hunt-style chairs fit perfectly in this modern-day living room, not to mention the beautiful hand-carved Hunt hutch, circa 1890. This baroque-style chair is a comfy spot for this little guy. 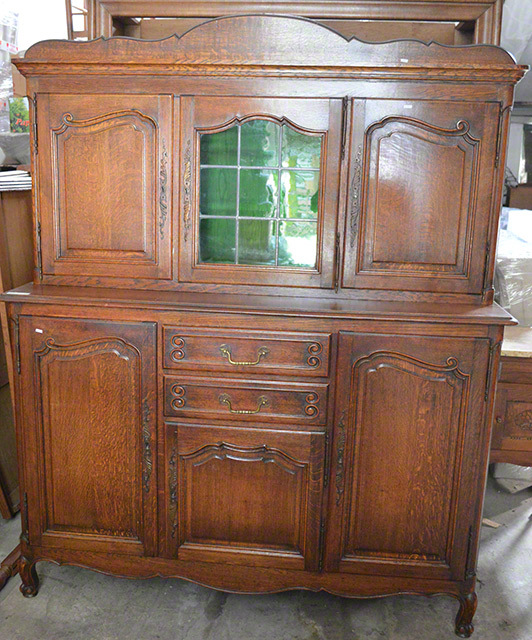 A classic piece like this French Hunt hutch is timeless, suiting this home decor “to a T”". A man’s home is his castle, no matter what era! This beautiful decor includes French Hunt chairs and a Dutch Pillow Cabinet. This gorgeous French clock depicting Lafayette with the cracked Liberty Bell is now home in Indiana. How lovely is this wonderful piece? Found on an estate in Belgium, now used for personal prayer in a home in Indiana. Classic US kitchen table and chairs, awesome wagon wheel, and to top it off, a beautiful Belgian corner hutch! A wonderful mix!